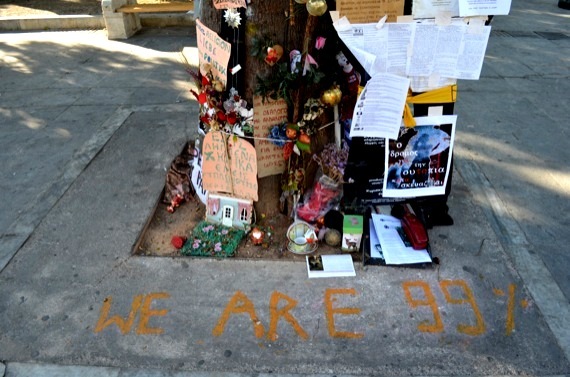 A tree trunk in Athens' Syntagma Square graced by the Occupy movement's motto. 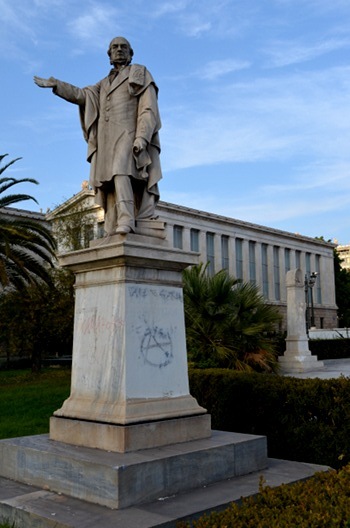 A statue in front of the National Library of Greece. As does Argentina, Greece has a long history of anarchist thought and practice. The most recent iteration dates back to the riots of 2008, following the shooting of a teenage boy by police. The country’s economic crisis of the past two years and the government’s effort to respond with austerity measures has only strengthened the movement. There have been enormous, volatile protests and occupations in Athens’ Syntagma Square, which spread images of Molotov cocktails and riot police around the world. 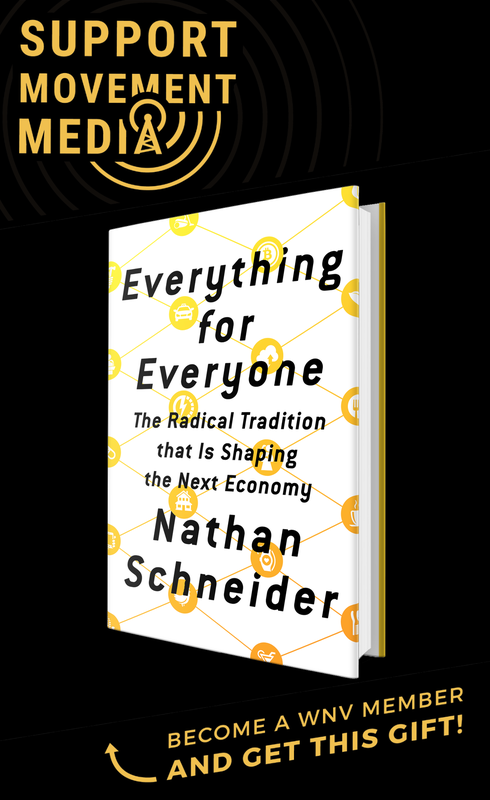 But those protests also gave birth to assemblies, as people revived the terminology of ancient Athenian democracy to explain their participatory, non-hierarchical decision making process. Since the recent demonstrations at Syntagma, such assemblies have become the norm among activists from around the country, who have now taken assemblies home with them. Like the Occupy movement in the U.S., Greek protesters have often been blamed for being selfish, impractical and short on clear demands. But, to the anarchists like those from the Assembly for the Circulation of Struggles gathered on Monday, such complaints ring hollow. 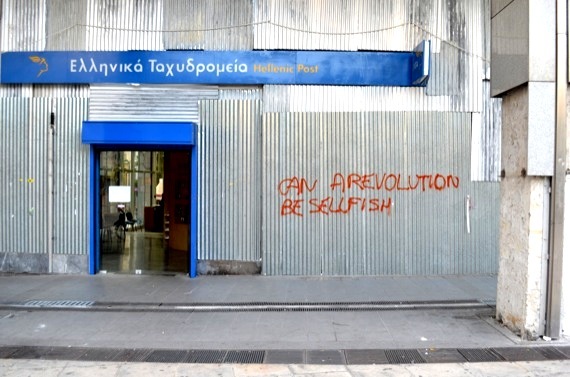 (Graffiti on the metal covering the windows of a post office on Syntagma Square reads, “CAN A REVOLUTION BE SELLFISH.”) Rather than demanding particular reforms of the government, they focus on creating alternative institutions to replace it, actively resisting by getting a head start on building the world they want to see. A post office facing Syntagma Square. Pieces of marble from the column at right have been torn off for use as projectiles. In the United States, says Marina Sitrin, “Our leftist political parties are nothing compared to those in Argentina and Greece.” The Democratic Party have much less of an impact on American radical groups than do the smaller communist and socialist parties that parliamentary systems allow to flourish elsewhere. What worries Sitrin especially about Occupy Wall Street right now is another form of co-option. 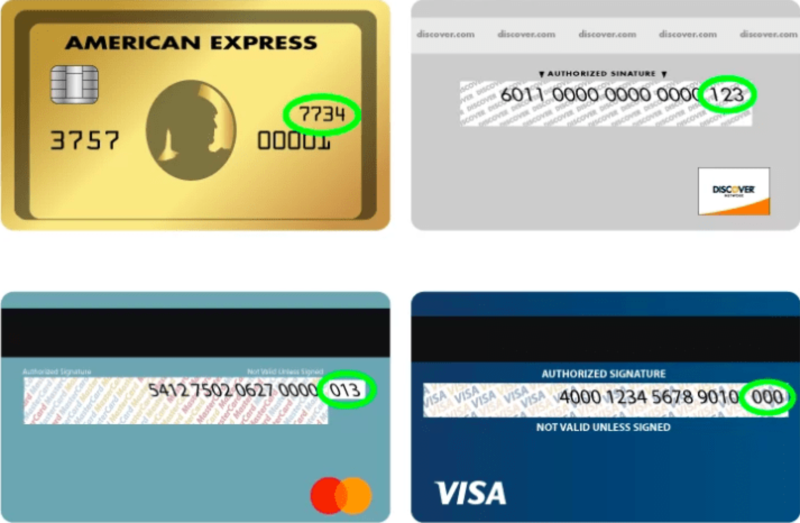 The Greeks smiled half enviously when she said, “Only in the U.S. do you start a movement and people give you money.” But Sitrin wasn’t bragging. “As a movement, we can’t have money. It’s a massive problem.” When supporters start donating large quantities of cash—as opposed to actual necessities like food and blankets—they threaten to turn the movement into a bureaucracy, or worse. 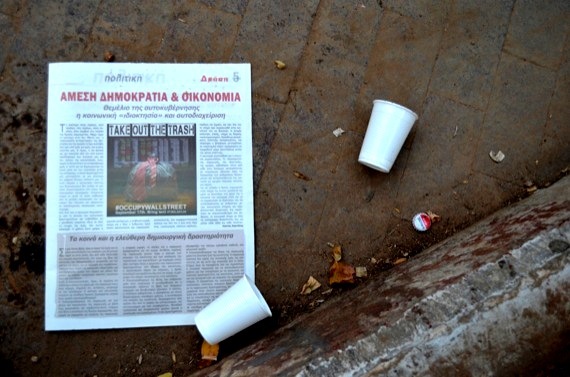 A radical newspaper left on Exarcheia Square featuring a poster from Occupy Wall Street.